Its almost my birthday week and am so excited for my weekend birthday. Today I have something different to share with you all. I am a cosmetologist and being part of this field i see most of people complaining about the dark circles. I wanted to share my knowledge on dark circles through this article. Are you having trouble in getting rid of dark circles. Let us first know why we tend to get dark circles. We all agree that skin under our eye area is much much thinner than the facial skin we can feel when touching it with fingers. Now if you are ageing there is going to be fat loss and tissue loss making your skin more thin and wrinkled. When we don’t give enough hydration to the skin it tends to dry out giving you first sign of ageing which is fine lines around eyes. 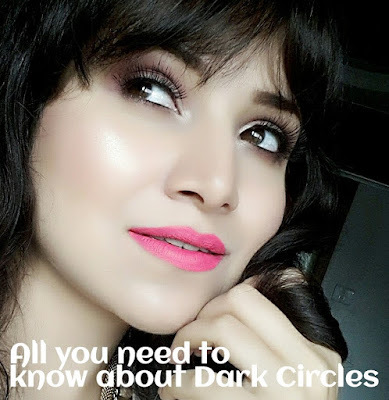 Dark circles have many causes which are mentioned one by one in this post. Now how to really identify you have got dark circles. Sometimes when you see bluish dark circles it can be due to venous congestion. You need to massage your eyes to improve circulation and so there is no stagnant blood in vessels. As our skin is thin this stagnant blood gives us bluish black appearance. Many people have got deep sunken eyes and the shadow of eyes make you feel that you have got dark circles in such cases its your hereditary facial structure you can go for injectable fillers in such cases. Well in such case you really don’t have them but still it appears to be that way. Nowadays man and women who are loosing weight and are on strict diet they too tend to develop dark circles due to starvation. Excessive weight loss can cause fat loos under eye area too. Hereditary is also one of the cause for permanent dark circles where you see dark circles run in family genetics. Smoking can cause wrinkling of under eye area as it helps in weakening of collagen tissue. Already due to thin skin it has very less collage and elasticity so smoking can cause faster ageing around eyes. Not having enough water, lack of sleep, stress and unbalanced diet can also lead to dark circles. Caffeine consumption is also one of the known cause for dark circles. When you have thyroid problems and iron deficiency i.e anaemia it can lead to dark circles. After crying for long time you observe puffiness under eyes. As water travels where there is salt in tissue it gives you bags under eyes. Sun damage which can lead to increase in melanin pigment causing hyper pigmentation and lastly ageing can weaken the tissues around eyes. Now after knowing the cause how you get rid of them? Very firstly you need to change your lifestyle. Distressing yourself by doing a regular exercise even if its 20 mins walk, yoga and going for spas can also help you relax. Having a good amount of sleep and a proper diet with increase in water intake can help. You need to hydrate yourself by drinking enough amount of fluids. Also you need too refrain from smoking. To hydrate your under eye area you need to use eye cream every night before sleep you need to massage it anticlockwise and clockwise to improve the circulation under eye area. Always wear sunglasses to protect your eye area from sun rays. Try to apply cold cucumber juice or slice of raw potatoes on your eyes. This may help in reducing tired dull looking eyes. If you tend to get puffiness around eyes after getting up in morning you need to change your sleep position by raising your head high. Retinol a cream will help in increasing collagen production thus helping to strengthen under eye area. Vitamin E and C creams also help for collagen boosting . If you got intense dark circles you can even opt for chemical peels and laser treatments like Laser resurfacing. IPL Intense pulse light can remove pigmented cells under eyes. Hydro quinine and Kojic acid are known as skin lightening creams which can be used with Intensive pulsed light treatment for hyper pigmentation under eye area. IPL can also help for venous congestion under eye area. This may take few sitting for desirable results. If dark circles is due to fat loss under You can even opt for hyaluronic acid facial which are temporary injectable fillers. Surgically Blepharoplasty is most effective way to get rid of dark circles permanently. There are plenty of creams and gels available. Creams work best for ageing skin and gels work best on young skin. When you are approaching 30 not only your skin needs anti ageing creams but even your under eye area needs it. The creams which contain caffeine helps in constricting dilated blood vessels under eye area. I even found aloe vera gels helps in reducing dark circles and puffiness. Once you start using creams you need to use them forever because they act only on temporary basis. Permanent treatments are peels and lasers but still for maintaining you will always have to hydrate your under eye area. As a makeup lover for me concelar is best way to give even flawless under eye area and to hide your dark circles but of course its just a temporary tool. Remember prevention is always better than cure. Keeping your under eye area well hydrated is the first thing you need to do. Hydration is first step towards anti ageing treatment. 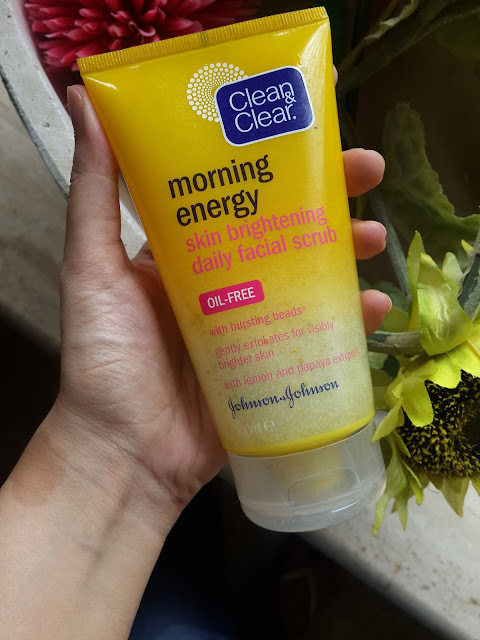 Today I am gonna talk about my favourite skin care product from Johnson & Johnson. It’s a Clean & Clear Morning Burst skin brightening facial scrub. I am absolutely in love with this face wash.I almost completed my one tube and this is the second one that I got. So thats how i decided i will be sharing my experience about this face wash with all of you. It comes in a bright yellow plastic tube. The scrub is lemon yellow in color and its more like gel based having exfoliating beads which I loved it. It has got unique combination of lemon, caffeine and papaya. This scrub has micro beads in it which are not so harsh on skin and feels like jelly. It smells so refreshing almost like lemon. I love any product which has citrus smell in it. I used this scrub every single day little amount is required for whole face and you just need to rub it in circular motion and wash it with water. 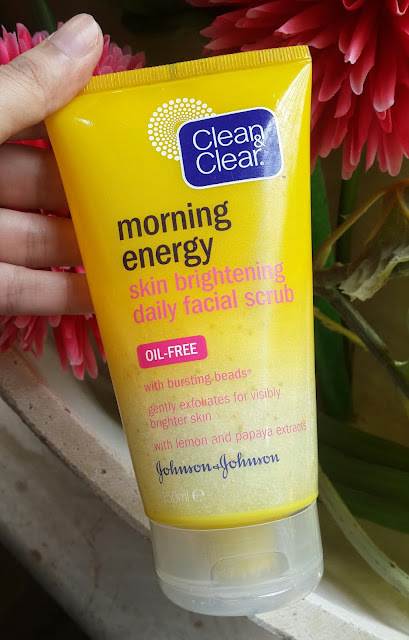 I generally like using this in night time as it clears all dirt makeup and oil from my skin also making my skin more refreshing clear and soft. As its written Morning burst skin brightening facial scrub it doesn't really make any difference to when you are using it. The very first time when I used on my face I was simply impressed with instant results. My skin felt smooth and baby soft it also helped in removing blackheads and some of whiteheads. I love the cool feel on my face after washing it off. It doesn’t make my skin much dry as I have dry to combination skin I am quite comfortable with this scrub. It also helps to brighten my skin after the first wash itself. This scrub can be great for normal to oily skin types. From the day I have started using this my skin texture and tone has improved quite a lot. I could feel the difference in my pores too. I haven’t got even single breakout after using this product. This scrub is surely refreshing for summer days too. I will be continuing using this scrub till I find something better than this. It’s the most affordable effective drugstore product. This tube goes long way. I totally recommend this product for girls having normal to oily skin types. Its worth buy. After a long time I could find a scrub which promises to deliver a healthy soft smooth glowing skin. It’s a must have product in your skin care routine. This is a scrub which I am no ways getting bored or tired of using it. It also helps in removing dullness of skin. I could hardly find any reviews about this product its been most underrated product. Its not easily available in india but still you can find them in some of the stores having imported beauty products. How’s you all doing? I am so excited we have almost started with month of October and its my birthday month. I was too busy for past few days was out of town and couldn’t get any excess to blog. And I have so missed talking about this new lippies. 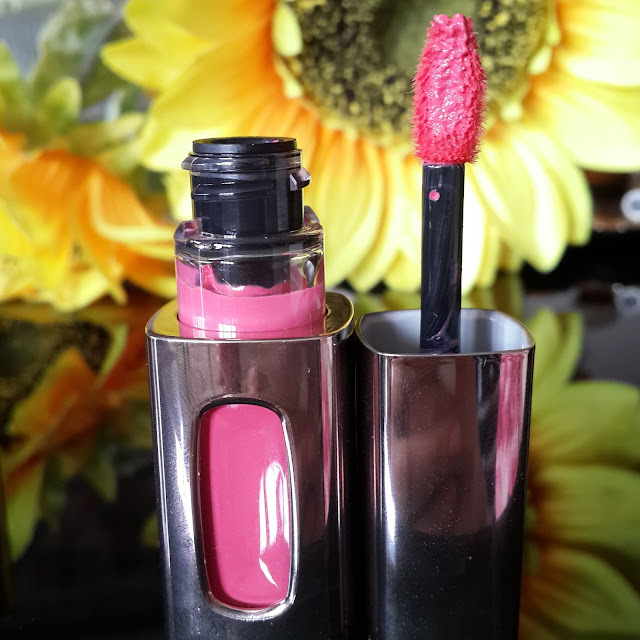 But as I am back I went crazy buying this newly launched L’Oreal le extraordinarie lipstick in Matte. Previously this lipsticks were more like glossy effect I still remember Rose Symphony shade which was one of my favorite. But this lipsticks are in liquid form turning out to matte finish so excited to try them on. I was having no idea of L’Oreal launching this lipsticks in MATTE range.Lets begin with the packaging. So this lipsticks come in a same old golden tube packaging with doe foot applicator . They have a color bar on each tube so you can easily find out shades without having the need to open tube. The applicator is very smooth and helps in delivering the product in best possible way. I loved how soft an right amount of product was picked up. I have got 3 shades from this range which are Montaigne brick, Madeleine pink, Opera amarantha. On application they have soft moisturizing texture. it glides on smoothly giving even application. They don’t make your lips dry. 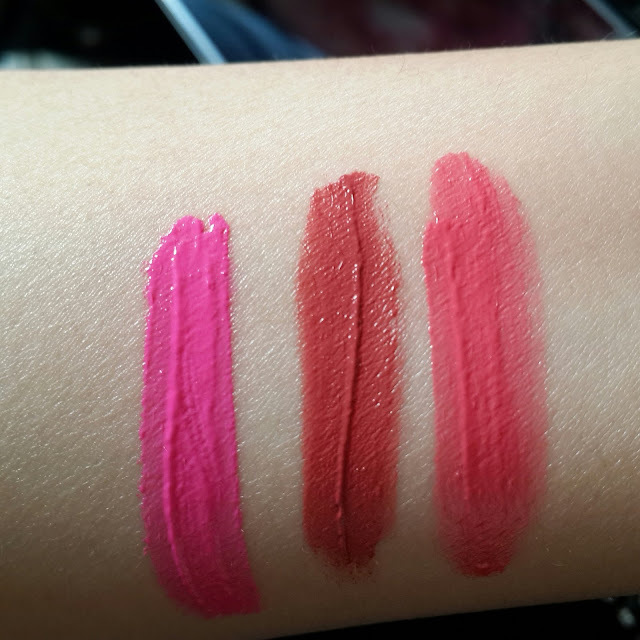 I am loving that this lipsticks are not completely matte but give semi matte finish. after application it takes time for lipsticks to get dry. It does contain sweet kinda fragrance which can be annoying if you don't prefer fragrance in lipsticks. 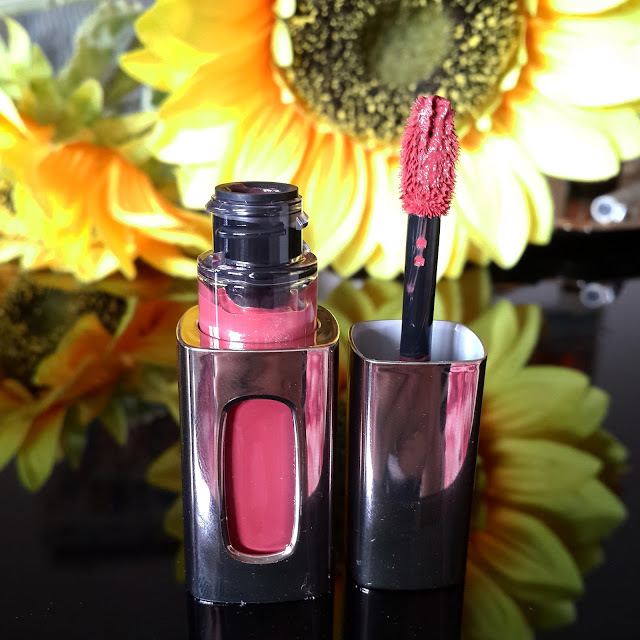 The texture of lipstick is creamy and gives semi matte finish. It doesn’t stain your lips except for opera amaranth which is bright bold pink. The colors are very subtle. Even the brightest pink color gives a subtle soft look. I would prefer this lipstick for everyday basis. They are easy to apply and quite comfortable on lips. The texture is feather light on lips. Gives you complete coverage. You don’t require any lip balm as this are hydrating. Doesn’t accentuate fine lines. Pigmentation is excellent. 1-2 swipe is enough for opacity. You can build this color as desired. 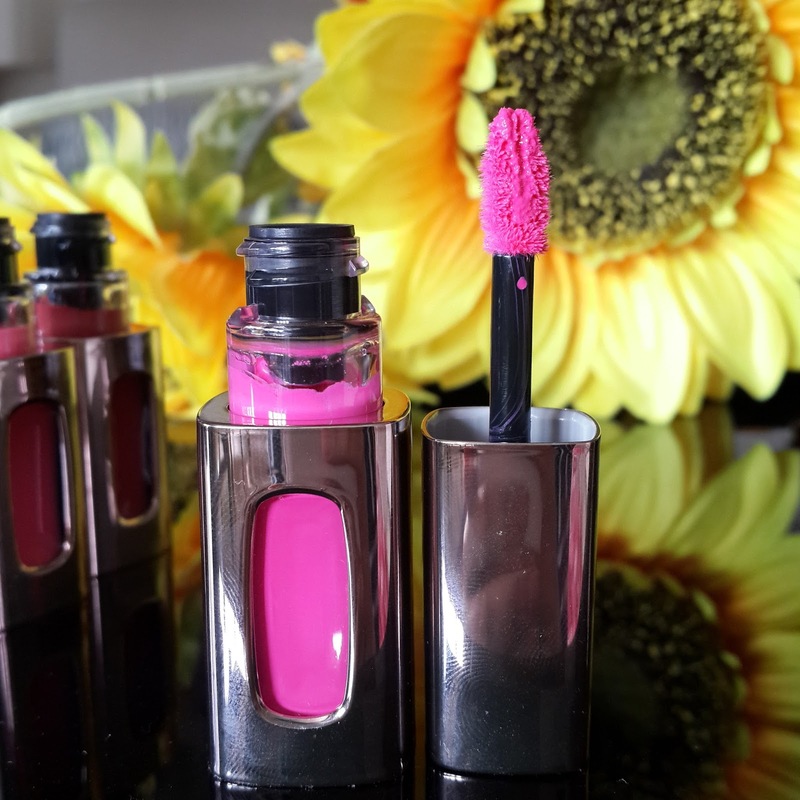 This lipsticks are not sheer so even pigmented lips can opt for this. They stay on for almost 4-5 hrs. they come of easily with makeup remover. Doesn’t settle into fine lines. Madeline pink is a beautiful subtle pink shade it can go well on warm as well as cool tones . it’s a great color for fair to medium skin tones. A everyday day color. Montaigne brick obsessed with his color a perfect warm brick color can go on almost every skin tone. Loved the way it adds warmth to my face. Opera amarantha a bright cool toned pink.. its aamaazing for hot summer days. Will go on almost every skin tone having cool undertones. Overall I totally recommended to everyone. Montaigne brick is absolutely my current favorite. It’s a perfect autumn color. 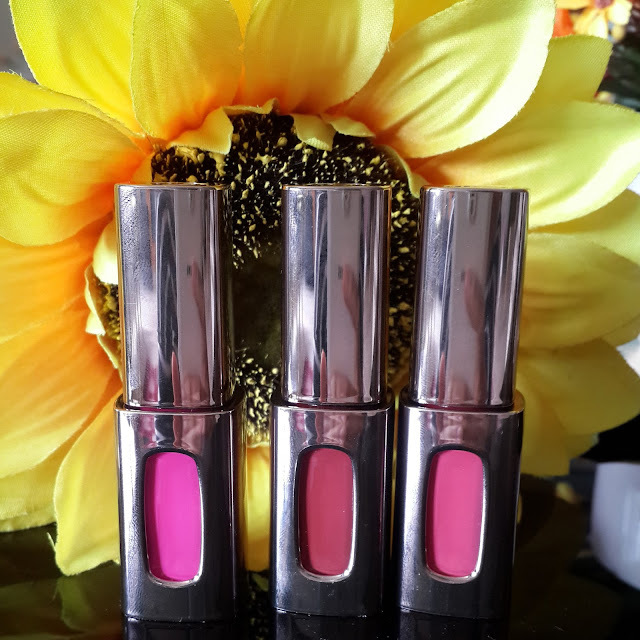 This lipsticks are creamy matte in form of liquid which is something I haven’t tried in long time. I am simply obsessed with this lipsticks and thinking of getting all the shades. Have you tried this lipsticks what are your thoughts on it?